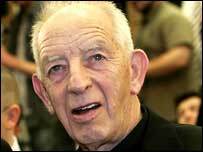 Fr Alec Reid said Catholics had been "treated like animals"
Unionists have condemned the priest who witnessed IRA decommissioning after he compared the unionist community to Nazis for past treatment of Catholics. 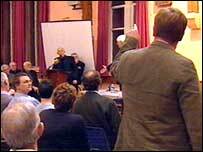 Father Alec Reid's remarks were made at a public meeting in south Belfast also attended by Reverend Harold Good, the Protestant decommissioning witness. The DUP's Nigel Dodds said the remarks were appalling, while UUP leader Sir Reg Empey said they were almost racist. Fr Reid later apologised, saying he had lost his temper. He said he had been provoked and offended by comments made by some members of the audience questioning his integrity and regretted the language he had used. However, the DUP's Ian Paisley Junior rejected this. "He's apologised, but he's explaining away the reasons why he made those comments," Mr Paisley said. Speaking in the House of Commons, Secretary of State Peter Hain said he joined in the condemnation of Fr Reid's remarks. The meeting was held at Fitzroy Presbyterian Church on Wednesday, and about 200 people were in the hall to hear what Father Reid and Mr Good had to say. Fr Reid told the audience: "The reality is that the nationalist community in Northern Ireland were treated almost like animals by the unionist community. They were not treated like human beings. It was like the Nazis treatment of the Jews." Mr Dodds, the North Belfast MP, said if unionists had made similar remarks they would be threatened with prosecution for inciting hatred. "The remarks by Alec Reid are appalling and reveal a mindset which could be portrayed as deeply bigoted and fundamentally racist," Mr Dodds said. Sir Reg Empey said the comments damaged Fr Reid's credibility as a witness. "It destroys confidence because how can the word of somebody using that sort of language be taken seriously. "That's sad, because I'm convinced that a lot of decommissioning did take place, but Fr Reid is actually undermining the very work he is supposed to be part of." Willie Frazer of the victims' group Fair walked out of Wednesday's meeting in protest. He said he was incensed by the priest's remarks. "I did fly off the handle but I could not sit there and allow him to accuse the unionist people of persecuting the Roman Catholic community for the last 60 years. That is far from the truth." On Thursday, Mr Frazer, five members of whose family, including his father, were murdered during the Troubles, said he did not accept Fr Reid's apology and said he was "trying to backtrack on what actually took place". Last month, Fr Reid and Mr Good acted as witnesses to the republican paramilitary group's final act of disarmament. Mr Good said he wanted to disassociate himself from Fr Reid's comments. "I identify fully with the hurt and anger felt by many within the audience and within the wider community. "However, I sincerely hope that Fr Reid's unqualified apology will be heard and accepted and that this incident will not be allowed to overshadow the significance of the decommissioning which was overseen by Alec Reid and myself." Former Presbyterian moderator the Reverend Ken Newell, one of the organisers of the meeting, said Fr Reid's comments had to be seen in the context "where things were said to him which I think were below the belt". Mr Newell said the priest was "wrong to say what he did", but he could see that within a short time of making the comments he had wanted to apologise.